Season 7 of American Horror Story starts on September 5, and as the show’s premiere fast approaches, plot points and important characters have gradually been revealed. The official trailer and the show’s title sequence have caused more speculation than ever, particularly as both appear to contain some important Easter Eggs regarding the new season. It was already clear that AHS: Cult would be terrifying, with grotesque clowns, and unidentifiable insects roaming around the promotional material. But the trailer and title sequence seem to have revealed something even scarier: the villains from all of your favorite scary movies might be making an appearance. Back in June 2017, Bloody Disgusting reported that AHS: Cult was filming in Haddonfield, Illinois, the home of Halloween‘s Michael Myers. And now, according to an eagle-eyed redditor, the latest AHS: Cult trailer features a glimpse of the actual house from Halloween at which Jamie Lee Curtis babysits in the first movie. 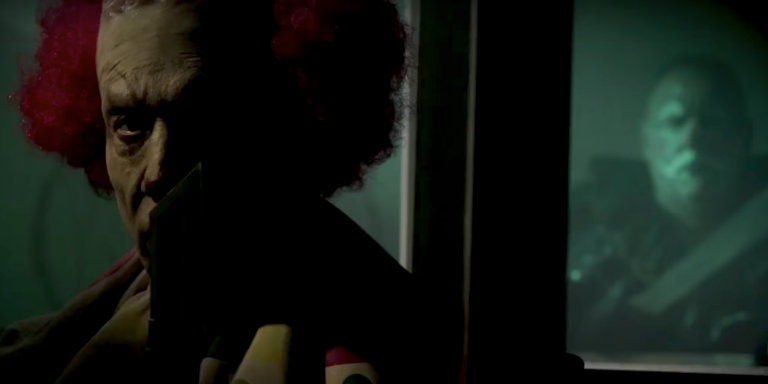 In the trailer, as a clown gets out of an ice cream truck, the house can be seen in the background. Pennywise from It also puts in an appearance, with one of the AHS: Cult clowns coming out of a coffin with a red balloon. A recurring shot of a carousel in the AHS: Cult trailer is reminiscent of Silent Hill, particularly as the character standing in front of it is wearing a hazmat suit, much like an Order Soldier from the franchise. As if that wasn’t creepy enough, the silhouette of Freddy Krueger seems to appear on the carousel. And it’s hard not to read the constant bee references as nods to The Wicker Man‘s infamous scene. And could the twins Sarah Paulson’s character Ally spots in the store be alluding to the twins from The Shining? And this particular clown looks like something straight out of Killer Klowns from Outer Space. Basically, the horror movie references in the AHS: Cult trailer and title sequence aren’t in short supply. If Michael Myers doesn’t actually put in an appearance in the season, his neighborhood certainly will, and that’s not a coincidence.